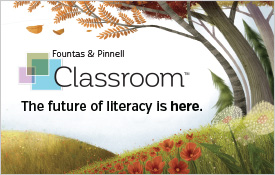 Browse Fountas & Pinnell Literacy™ downloadable study guides, order forms, promotional materials, research, tools, samplers, webinar videos, and more. Fountas & Pinnell Classroom™ (FPC) is a first-of-its-kind, cohesive system for high-quality, classroom-based literacy instruction centered on a powerful principle: what we teach, we value; and what we value, we teach. Turning a vision into action requires a carefully laid out plan. Use this printable Interactive Implementation Plan as you unpack, organize, and begin to implement FPC. The 3 steps in this interactive plan are designed to put you, your students, and your school on the path to literacy success. The full version of this resource requires registration. It's free! Fountas & Pinnell Classroom™ (FPC) is a first-of-its-kind, cohesive system for high-quality, classroom-based literacy instruction centered on a powerful principle: what we teach, we value; and what we value, we teach. Turning a vision into action requires a carefully laid out plan. Use this printable Interactive Action Plan to think together with colleagues, and prepare a plan to implement FPC. The 4 steps in this interactive plan are designed to put you, your students, and your school on the path to literacy success. In this exciting hour-long conversation with Irene Fountas and Gay Su Pinnell, we’ll focus on grades 4-6 of Fountas & Pinnell Classroom™ and examine how lessons and texts increase in sophistication and complexity, requiring students to meet increased demands for critical thinking, social/emotional growth, and deep level conversation. Get your first glimpse of Fountas & Pinnell Classroom™ with these comprehensive digital samplers. These samplers provide example lessons for each instructional context within Fountas & Pinnell Classroom™: Interactive Read-Aloud, Shared Reading, Phonics, Spelling, and Word Study, Reading Minilessons, Guided Reading, Book Clubs, Independent Reading; Sample Guided Reading and Shared Reading texts; and descriptions of the many valuable Professional Learning Tools. The Fountas & Pinnell Classroom™ Guided Reading Collection will include 1300 new, original titles (6 copies of each title) that span levels A–Z on the F&P Text Level Gradient™, with an accompanying lesson folder for each title. These guided reading books were created by a team of talented authors and illustrators under the direction of Irene Fountas and Gay Su Pinnell. Each book is carefully calibrated to match the text characteristics underlying the F&P Text Level Gradient™. 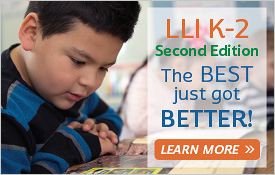 Review the release timeline of Guided Reading books from Grades K–6. Phonics, Spelling, and Word Study offers explicit lessons for whole-group instruction and individual, partner, or small-group application that help students attend to, learn about, and efficiently use sounds, letters, and words. In this hour-long webinar, you’ll learn more about how to incorporate this important instructional context into your classroom. This document is an alignment of the 2017 English Standards of Learning for Virginia Public Schools to The Fountas & Pinnell Literacy Continuum, Expanded Edition for Grades K-6. 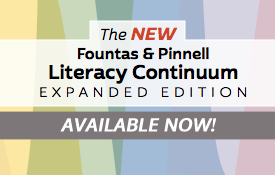 This document is an alignment of the Tennessee English Language Arts Standards to The Fountas & Pinnell Literacy Continuum, Expanded Edition for Grades K-3. This resource reviews the research base for Fountas & Pinnell Classroom™, a cohesive, multi-text approach to literacy instruction for all students in grades PreK-6. Words That Sing: Poetry Charts for Shared Reading is an illustrated collection of poems, songs, and rhymes that will fill children with language, ideas, and imagery, which will help them use and enjoy the oral and written word.